Syn-Apps LLC, an industry pioneer in IP emergency mass notification solutions, announced its Revolution notification software has passed Cisco interoperability testing with CUCM (Cisco Unified Communications Manager). Syn-Apps worked with tekVizion, an independent third-party testing laboratory, to verify Revolution’s compatibility with CUCM 12.x. 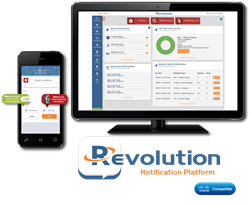 Revolution serves as the central platform used to manage notifications across disparate systems and endpoints such as IP phones, IP and analog speakers, mobile devices, desktop computers, digital signs, and more. The software enriches unified communication networks by bringing multimodal emergency mass notification and advanced IP paging to the Cisco UCM platform. Revolution is interoperable with a number of IP endpoints from trusted Cisco partners, such as Algo, AND, Atlas IED, CyberData, Valcom, and many more. With Revolution, Cisco customers can streamline their notification processes, allowing them to rapidly alert people located within the building or off-site more efficiently, safely, and reliably. tekVizion’s labs contain the most extensive set of business communications platforms and VoIP technologies to help companies certify solutions, verify interoperability, and maximize their solutions. This includes both legacy and the most current versions of leading technologies to help vendors and service providers test and validate solutions. A growing list of vendors and service providers are turning to tekVizion to independently certify their solutions. Contact sales@Syn-Apps.com or visit https://www.syn-apps.com/products/revolution-notification-platform to learn more about Revolution’s unified solution for Cisco IP paging, mass notification, and emergency alerts. Syn-Apps LLC is a leader in notification solutions with a focus on IP communications designed to improve business processes, increase safety, and streamline internal and external communication. Since 2001, thousands of organizations have integrated Syn-Apps' notification solutions with phones, paging systems, IP speakers, and hundreds of other systems and services. For more information, please visit: http://www.syn-apps.com. tekVizion validates, certifies, and automates communications and collaboration to accelerate Connected Business. Our deep expertise and vendor neutrality makes us the most trusted partner in the industry. In an increasingly connected world, we preempt the disconnect! Learn more at http://www.tekVizion.com or @tekVizion on Twitter.